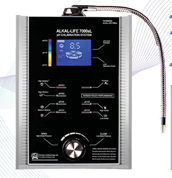 The Alkal-Life 7000 sL is the next generation of water ionizer from Richway International. Released in January, 2010, it is an upgraded version of the 3000 sL. It is, by far, the most advanced water ionizer in the world. Richway's Alkal-Life is computerized to calibrate exactly what your tap water needs to be the best ionized alkaline water you can get. A touch screen system, making it even simpler to use. Self-diagnostic to automatically alert filter changes and other system requirements. A more refined, advanced calibration system that accurately defines the pH level, creating higher ionization. A platinum pin, creating smaller water clusters and higher ionization. A filter that contains silver, eliminating bacteria more effectively, creating pristine ionized water. Our satisfied customers have much higher-priced systems that range from $2,000 to $4,000 and are confident they have discovered all the benefits of this advanced technology at the best price. Most people are missing the point about water these days, thinking that filtered water is good enough. Water drastically impacts our health and the important elements of alkaline ionized water are: alkalinity, an abundance of oxygen, hydration ability, free radical scavenging and a negative mill voltage charge (ORP: Oxidation Reduction Potential). The electrolysis process does not only alter tap water into the desired pH (potential hydrogen) level, it also compromises the Oxidation Reduction Potential (ORP). Altering molecules into micro clusters achieves the remarkable production of antioxidants! In the average foods and beverages we consume, a negative (-) ORP number is a crucial ingredient to good health. High consumption of acids and products with a positive (+) ORP will not only counter-balance undesirable oxidation to human cells, it can also lead to an individual vulnerable to disease and aging faster. The Alkal-Life 7000 sL, inspired by leading researchers in Asia, will deliver you pristine water that has a higher absorption rate - a taste you can feel! 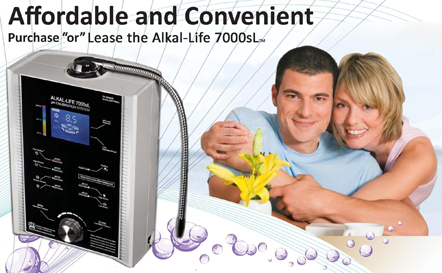 Tested and proven with a low ORP, we challenge you to try the advanced Alkal-Life 7000 sL water ionizer. The Alkal-Life was compared to Kangen Water SD 501 and Ionia's JP 108, two ionizers that will cost you thousands more than the Alkal-Life. The test date was September 1, 2009. All three water ionizers have the same flow rate of 1.5 liters per minute.